Learn how to create your own lite apps on Android. 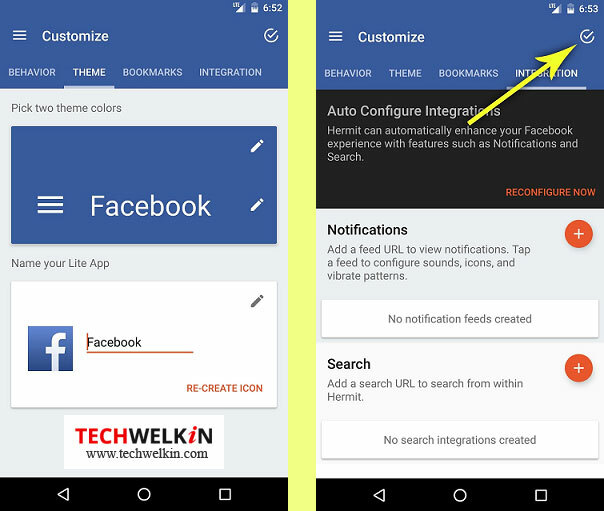 Not all apps have lite versions like Facebook Lite app. But with Hermit you can make a lite version of any app! Lite app uses the mobile version of the website. We all love smartphones as we love using apps available that caters to our various requirements. But did you know that most of the web services apps for Android are battery life drainers? Of course you know, but you have no choice as you like these apps. Well, the truth is that you do have a choice. You can create your own “lite” app of your favorite web service. Few clicks and a little patience is all you need. The lite apps help free storage space and extends battery life without compromising on the features. Since lite apps are not available for all website, you will need to download a utility called Hermit, from the Play Store. Hermit is technically a web browser that supports customization. You can customize a web service to make an ad-free app of your own that also saves battery life. Hermit creates a shortcut with an icon of the web service on the home screen of the launcher. The shortcut can be used as a stand-alone app and customized as required. It does not run in the background, therefore cannot track you. Download Hermit and follow the instructions to install the app. The app is supported on Android 4.4 and above. However, it is best experienced on Lollipop and above. You can create only 2 lite versions with the free app. To create unlimited apps you need to opt for the Premium version. Open the app and click on the top left corner to display the menu and click Create or you can click on the button at the bottom-right corner to start creating your lite app. The subsequent screen displays two options to create the app. Pick your choice from the ready-made lite app library as displayed in the image below. The library includes most the popular apps. Note: Screens may differ slightly, depending on the device you are using and the Hermit version but options will more or less be the same. 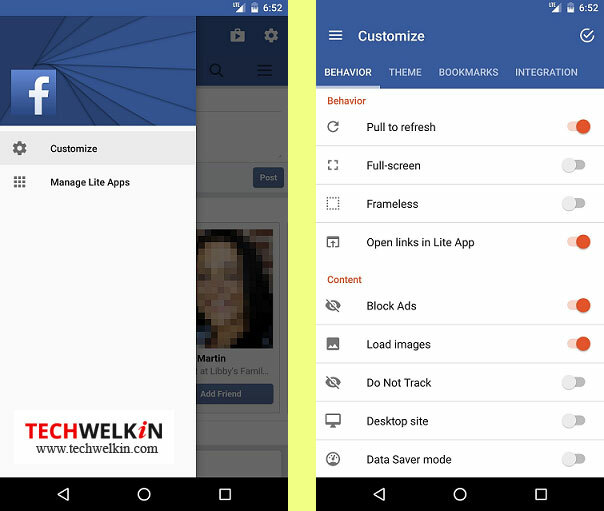 As an example, let us create the lite version app of the Facebook. Regardless of the method that you choose, the set up process remains the same. 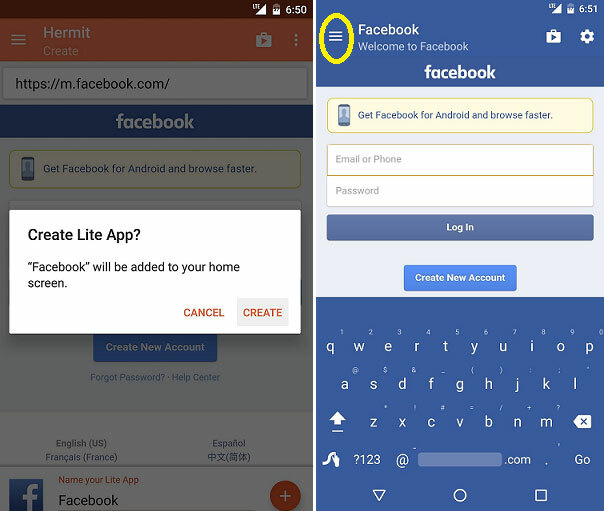 Note: If you have the Facebook installed on your device, uninstall it before proceeding to create the lite app version of the Facebook app. Select Facebook from the available library. When asked to confirm if you want to install the Lite App Facebook, click OK to confirm. A shortcut of the selected app is created on the home screen. Click the Facebook app icon on the home screen. The web page of the selected app opens. Click the top-left icon as displayed above to display the drop-down menu. From the menu, select Customize to tweak the app as per your choice. The Behavior tab has several interface options that are intuitive. You can also have external links open in your lite app. The Block Ads option is enabled by default. There are few other options as well that lets you customize the content from the website like Content, Privacy, Permissions etc. You can choose the options under each of these headings to customize the app. It is advisable to choose Frameless, for a regular app-like look and feel experience. The customize options are the same for all the lite apps. Click the Themes option. This screen allows you to set custom colors for the status bar and action bar at the top of the screen. 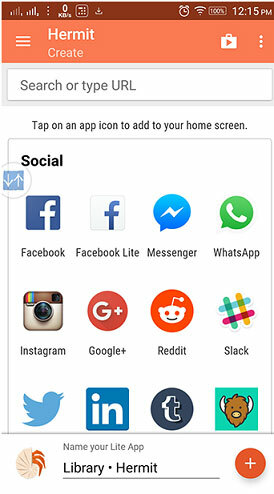 You can also re-create the lite app’s icon instead of retaining the Facebook icon. The Integration tab lets you set up notifications and search functions so that your lite app functions like any other normal app. The Bookmarks tab is intuitive; the options allow you to bookmark the pages as required. After making the changes click the top-right check mark icon to save the changes made as displayed in the above illustration. After creating a lite app, Hermit automatically adds an icon to your home screen. To launch the newly created lite app, tap the icon and start using the app as required. Except for the interface, the rest of the app is basically the mobile version of the website that you can use as required without draining your battery. Creating a lite app version is ideal for people who prefer to browse their favorite web service using the web browser rather than the app to save the battery power. Hermit is the perfect solution for such users.